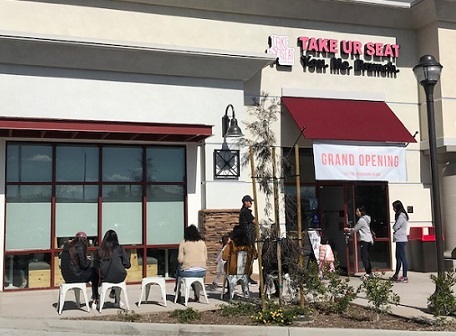 Calling itself “the American classic brunch with an Asian twist,” Take Ur Seat opened in January in a new development, Rincon Plaza, in a booming portion of Chino Hills. The restaurant motto: “You. Me. 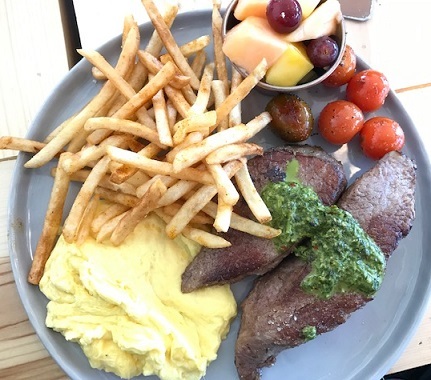 Brunch.” Note: The official name seems to be Take UR Seat, but I’m going to pretend it’s not. It’s fairly small and apparently often packed. It certainly was at a recent Saturday lunchtime, when my friends and I put our names in and joined a dozen people waiting outside. But that gave us time to study the menu. 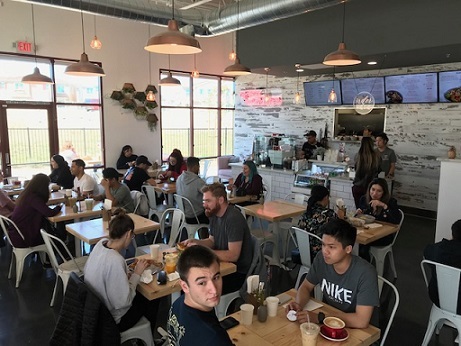 It’s short and focused, with cloud pancakes, french toast, avocado toast and a couple more breakfast items, a half-dozen bowls with pork belly, spam, kimchee or tri-tip, two salads and a variety of coffee and specialty lattes. The chef cooked at Cal Poly Pomona’s international kitchen prior to this. We were called in after 50 minutes, given a table and allowed to order at the counter, with no one in front of us. There’s lots of natural light, wood tables, pendant lamps and a modern, cheery feel. Our food was delivered in a reasonable amount of time. In short, we liked what we got. I had the kimchee fried rice omelet ($10), with pork belly, spam, seaweed and fried rice. I actually didn’t notice the spam. Someone else got the spam rice bowl ($8) with steamed rice, fried eggs, spinach and crispy onions, plus fries ($4), which we all devoured. 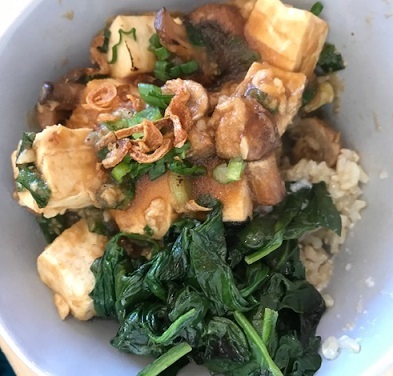 Our resident vegan had the tofu mushroom bowl ($10), with steamed rice and spinach, forgoing the poached egg. “It was flavorful and satisfying,” she said. She also noted it was the only item on the menu she could have ordered. She also enjoyed a matcha latte ($5). 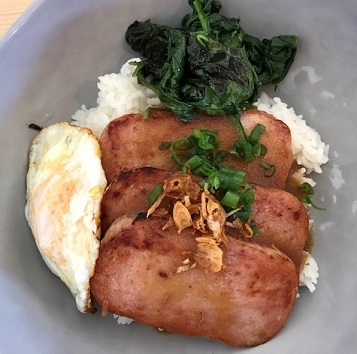 The fourth member of our merry quartet had the Tip Me Over rice bowl ($12), with charbroiled tri-tip, steamed rice, spinach, spinach and poached egg. “I walked in hungry and I’m walking out satisfied,” he said. For the record, he was projecting, as he was still seated at the time. 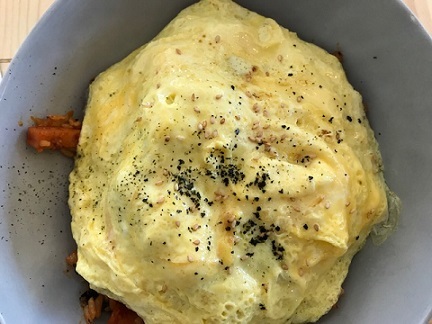 He’d been here once before and had the Big 5 (eggs, bacon, sausage, tomatoes and home fries, $12) and said he’d go back to that on his next visit. I would come back. Take Ur Seat reminds me of Rancho Cucamonga’s Combine Kitchen, which similarly pairs coffee with elevated takes on American and Asian dishes. A few things worth noting: At night Take Ur Seat had just instituted a “night vibe dinner menu” with items from the owners’ native Indonesia. By 1:30, there were empty tables, so you might want to time a visit to an off-hour for quicker seating. Also: This may be the rare brunch spot that’s closed Sundays. Plan your life accordingly.